This carefully crafted ebook is formatted for your eReader with a functional and detailed table of contents. New Zealand (Māori: Aotearoa ) is an island nation in the southwestern Pacific Ocean. The country geographically comprises two main landmasses—the North Island (or Te Ika-a-Māui), and the South Island (or Te Waipounamu)—and around 600 smaller islands. New Zealand is situated some 1,500 kilometres (900 mi) east of Australia across the Tasman Sea and roughly 1,000 kilometres (600 mi) south of the Pacific island areas of New Caledonia, Fiji, and Tonga. Because of its remoteness, it was one of the last lands to be settled by humans. During its long period of isolation, New Zealand developed a distinct biodiversity of animal, fungal and plant life. The country's varied topography and its sharp mountain peaks, such as the Southern Alps, owe much to the tectonic uplift of land and volcanic eruptions. New Zealand's capital city is Wellington, while its most populous city is Auckland. 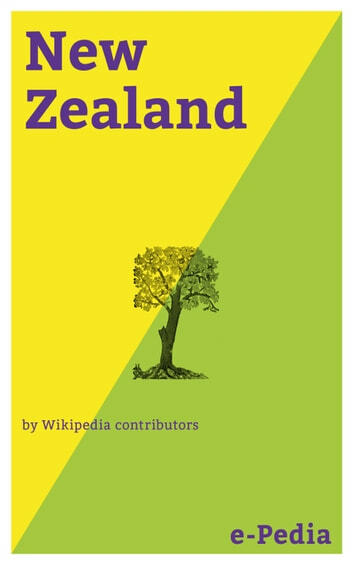 This book has been derived from Wikipedia: it contains the entire text of the title Wikipedia article + the entire text of all the 902 related (linked) Wikipedia articles to the title article. This book does not contain illustrations. e-Pedia (an imprint of e-artnow) charges for the convenience service of formatting these e-books for your eReader. We donate a part of our net income after taxes to the Wikimedia Foundation from the sales of all books based on Wikipedia content.